Piccard Pictet was Switzerland’s only automobile manufacturer. Prior to producing motorcars Piccard Pictet were best known as hydraulic engineers who specialised in manufacturing mechanical devices, machinery and turbines in their workshop in Geneva. The company began producing motorcars more by chance than by decision. In 1904 brothers Charles and Frédéric Dufaux wanted to build their own race car for the Gordon Bennet event but lacked the necessary tooling to build precision parts for the engine and gearbox and so approached Piccard Pictet to build the car. However, the elderly Paul Piccard did not believe in the future of the Automobile which was still in its infancy and so resisted the idea of turning the company’s focus to producing cars and it was left to Lucien Pictet, brother of a banker of considerable means to enlighten the elderly Piccard of the potential of personal motorised transport. While Pictet ultimately succeeded in persuading Piccard there remained friction in the company structure and so a separate company Société d’Automobiles de Genève who produced cars under licence. After being appointed Managing Director of SAG, Pictet travelled to Barcelona to meet with fellow Swiss Marc Birkigt of Hispano-Suiza. Pictet had long admired Hispano-Suiza’s cars and had an ambition to make the cars more Swiss than Spanish and so negotiated a licence agreement to produce 120 chassis at 300 Swiss Francs per car. This agreement brought the company a steady income but no doubt hampered their own development designs. When the Hispano-Suiza contract came to an end in 1909 Piccard Pictet began trading under their own name once again and were now free to pursue their own engineering philosophy. Their cars very quickly became thought of as a Swiss Rolls Royce with the same attention to detail, quality and reputation for reliability. Despite their comparatively small output Piccard Pictet were right at the forefront of automotive development and were one of the first companies to recognise the benefits in refinement of the single-sleeve valve design and signed a licence agreement to produce the a engine design with Scottish manufacturers Argyll. By 1913 Pic Pic as they had now become affectionately known had earned such a good reputation that the Swiss Army placed an order for a large number of Pic Pics that were still in service in the late 1930s. The Pic Pic we have for sale here is an incredibly original 1913 20/30 model and is believed to be the only one in existence. The previous owner, Mr Adam bought the car in 1957 and transported it to his hometown of La Plata in Argentina. Mr Adam bought the car with the intention of dismantling the rear section so he could install a loud speaker and drive around the streets of La Plata to advertise his business. Unfortunately for Mr Adam the local council banned the practise of promoting business by public audio system in public areas and so the Pic Pic was saved. 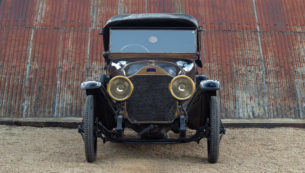 Having never been intended for personal use, the car remained in the warehouse of the family business long after Mr Adam’s death in 1969 and was eventually bought in barn-find condition by the owner in 2016. 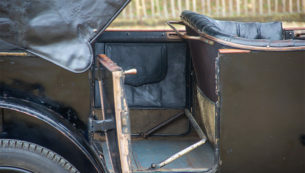 Since then the Pic Pic has been re-assembled, dusted off and remains in original condition with no alterations or restoration since it left the factory 105 years ago. Being the only Swiss manufactured car and remaining in preservation condition, this remarkable Pic Pic represents a fantastic opportunity to own an important piece of automotive history.